The man pops out books like no one else’s business. And he’s one of the few who is able to engage at both the scholarly and popular level. As a colleague of mine recently remarked, no one can ever take up Pauline studies (or New Testament or Jesus studies, for that matter) from now on without pouring over Wright’s works. He’s done that much work and has had that much effect over the past few decades! Well, he’s throwing another work into the masses, set to go live on October 1st of this year. What’s the gist of this shorter, 100-page or so work? He’s taking time to respond to his critics, particularly 5 sticking points. In the last two decades N. T. Wright has produced a succession of connected volumes that explore the nature and origins of Christianity. Wright has consistently argued that Christianity, while indebted to Second Temple Judaism, represents a significant development. With major books on method and background, Jesus, and the resurrection already in print, in Paul and the Faithfulness of God, Wright added a comprehensive study of the Apostle to the Gentiles. Wright’s Paul, as well as his reading of Christianity, is not without its detractors. In The Paul Debate, Wright answers his critics. The five chapters represent a response to the five most questioned elements of his understanding of Paul. The first chapter takes up the question of Paul’s theological coherence, particularly the way in which his Jewish context, and the story about Israel he inherited, interacted with what he came to believe about Jesus, a Christological story. Chapter two follows on by tackling the debate over the background, origin, and implications of Paul’s Christology. The third chapter addresses the questions of covenant and cosmos, narrative and apocalyptic. Chapter four focuses on the debate over Paul’s view of who constitutes the people of God; this chapter also addresses the question of whether justification belongs to Paul’s soteriology or his ecclesiology, or somehow to both. The final chapter then traces debates about method, both Paul’s and ours, as well as questions of discovery and presentation, again, both Paul’s and ours. 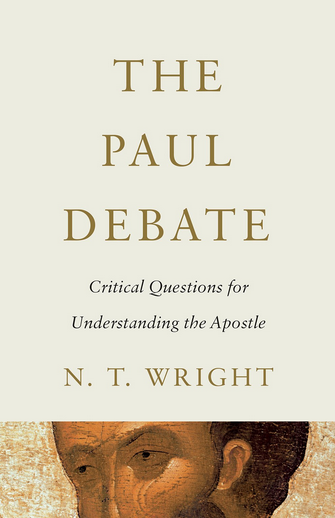 The Paul Debate is essential reading for those who both agree and disagree with Wright, and for all who want to understand the compelling voice of one of the most read and productive Pauline scholars in the past decades. Though he gets not everything “right” (pun intended), I appreciate Wright’s great work in New Testament, Jesus, and Pauline studies. This entry was tagged books, N.T. Wright, new Pauline perspective, Paul. Bookmark the permalink.